While I would usually define boots/heels and other other type of shoe trends under 'micro trend' (something that's 'in' the season but on a smaller scale, usually accesories or a specific fabric or shoes) this season I have put boots in a league of their own. It started with the leather cutout boots this summer. Boots and hot weather? I didn't think it would mix either, but the idea of having a cutout style was a huge success and carried into Fall, when more people usually start wearing boots as the colder weather emerges. The cutout still is a huge trend and influenced other designer to make there own take on it. I will admit, I have never been a 'boots girl' and if you asked me last year I would have shuddered at the thought, thinking of loud Doc Martins, but this year, with boots streamlined and more formal, I love them! Even a few of my friends, who seem to live in hi-tops and converse, have gotten boots, however they got slightly less formal ones with studs and soft material rather than leather, to match their style. After about two months of looking I finally found the perfect boots for me, as you can see in the picture, leather gold buckle style boots with a slight heel from New Look, which I think were €29. 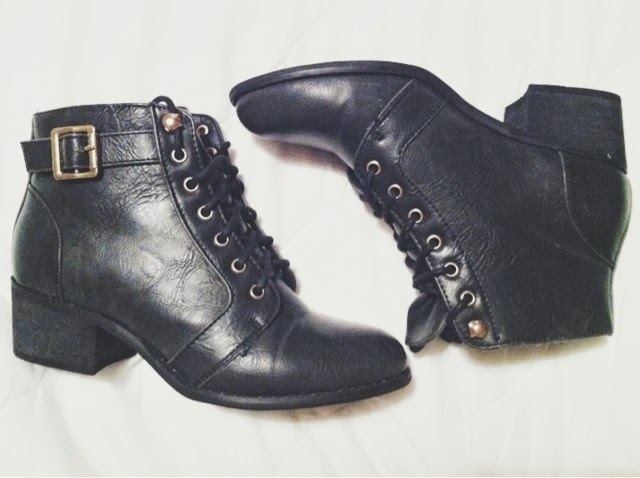 I never thought I would, but I love boots and now embracing the cold weather with my now new favourite shoes!